So. Here’s the deal. I was having some trouble getting into the holiday spirit. And I think I know why. First off it’s becoming way more commercialize than I care for. I think we are way far from the meaning of the whole season. And I think the other part about it is the stigma and the rules and pressure about gift giving. It’s stressful. I gave up getting gifts for people years ago…. But I really love being generous. This creates a struggle. I like giving without expectation of getting something in return. So when God laid this idea in my heart I was excited. A recent sermon at church sparked this idea as well. We have been talking about how blessed we are and not only that it our blessings in life usually come through other people. Bottom line is I am blessed to be a blessing. So. God laid a plan on my heart. Send a handwritten card and a small gift card to 25 people. One person everyday from December 1st to Christmas. He is coming up with who shall be the recipient of this blessing. I am just being the vessel. I did freak out a little at one point because I didn’t know how I was going to afford it. Even a small gift card for each adds up. God heard my concern and said “don’t worry child, I got this.” So… I have embarked on this journey. No turning back. Trusting God. Being a light. Spreading joy. So… I did it! Well… God did. I just obeyed. Truth is… I felt more fulfillment at the end of this holiday season than I ever had. First off all I have to say when God says “I’ve got this”… Trust him. I ended up getting the money to cover this and then some. (Won an award). And it turns out I heard story after story of how my “blessing” came at just the right time and touched the recipient. The note encouraged and made people smile. I send a couple of gift cards to be passed on to someone else. I sent one to a lady I barely knows but she inspires my mom. I ended up seeing her at a store and she said it meant a lot to her. 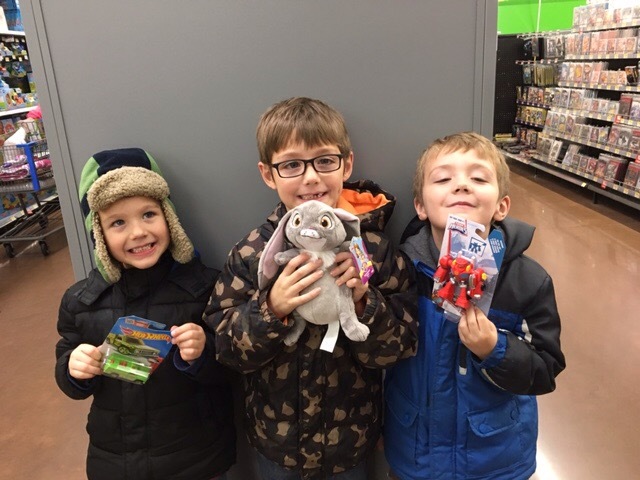 I took three of my nephews (the twins are 6 and the little one is 4) out to buy toys for tots so they could get in on being a blessing too. They loved it. We talked about how spoiled.. I mean blessed…. They are and how not all kids are that lucky. They were excited to be a blessing. They did it with an attitude of expecting nothing in return. It was a blessing to me too see! I honestly wanted to just keep blessing people. One of the coolest parts of this whole thing was how it inspired the boyfriend. I had told him I didn’t want a Christmas gift (being 100% serious… I am not one of “those girls” who just says they don’t want anything and then gets mad about not getting something). So what he did instead was give me a very sweet card with a check to be donated to the charity of my choice. Once again allowing me to be a blessing. Blessed to be a blessing… Not only at Christmas… But all the year through. Because I was having WordPress issues 😦 better late than never right?! ?